There are many outdoor activities taking place during Summer. Whether it’s a beach, a lake, or even an amusement park, summertime is when we go out to play. While women apply sunblock to protect their skin from harmful UV light, we usually don’t give the same amount of attention to our hair. Humidity and summer heat can make your locks more vulnerable to damage or becoming brittle. According to naturalhealthmag.com, these 5 natural oils are great for protecting your hair from free radical damage. 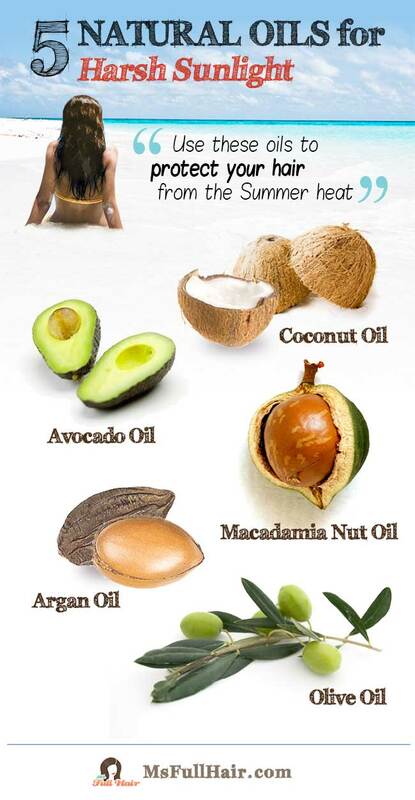 Next time, don’t forget to apply a couple of drops of oil onto your hair before you go out into the Summer sun. Coconut oil makes an ideal natural treatment for dry and brittle hair. Its natural creamy texture allows easy absorption to penetrate skin and hair providing more shine and luster. Rich in vitamins and minerals, avocado oil contains an antioxidant property that encourages healing your skin from sun damage. Macadamia oil is high in monounsaturated fat which is known for keeping your good cholesterol high and bad cholesterol low. It also contains palmitoleic acid which is vital for preventing cell aging. Also known as the magic oil from Morocco, Argan oil has been used for glowing skin and hair remedies for centuries. Thanks to its antioxidants, olive oil promotes an ideal scalp environment for healthy hair growth by removing any fungi and bacteria.